About 4.6 billion years ago the solar system was formed by condensation, contraction and subsequent collapse of an interstellar cloud. More than 99% of the matter of the solar system was concentrated in the sun and the rest contained in planets, meteorites and comets. 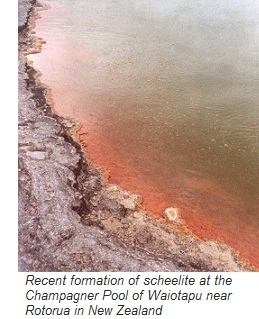 This event stopped the continuous evolutionary change in element concentrations of the system. 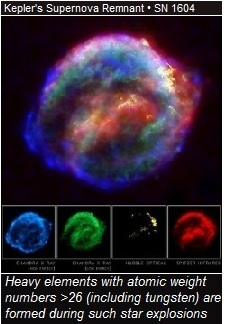 Besides hydrogen and helium, as well as the other lighter elements formed by fusion processes within stars, the cloud also contained the heavier elements generated during the short times of extremely high proton and neutron fluxes prevailing in supernova explosions (as a result of absorption reactions). One of the heavier elements in this "star ash" is tungsten. It ranks number 56 of the elements in terms of earth crust abundance and number 18 among the metallic elements. A main factor determining the location of tungsten deposits is the proximity to orogenic belts because of a marked association between tungsten deposits and those mountain belts as, for example, in the Alpine-Himalayan and the Circumpacific Belts. In particular, major tungsten deposits occur in the fold belts of the Far East, in South China, Thailand, Burma, South Korea and Japan. Rich ore deposits are situated in the Chinese provinces of Jiangxi, Guangdong and Hunan, where all important types of ore deposits can be found (amongst others, the largest scheelite mine in world: Shizhuyuan). In these areas even basaltic rocks contain higher concentrations of tungsten, which has been interpreted by Chinese researchers as an anomaly of the underlying mantle. Similar belts extend throughout the Asiatic part of the former Soviet Union. Tungsten is also present in the eastern costal fold belt in Australia and the Alpine belt from France to Turkey. The Rockies and Andes as part of the Circumpacific belt contain a number of important deposits in Canada, USA, Bolivia, and Peru. Ore deposits in Africa (Rwanda, Uganda and the Republic of Congo) and Brasil (Rio Grande del Norte, Rhodonia) indicate a common ore formation history of Sn/W deposits before the opening of the Atlantic Ocean (ie separation of Africa and South America) about 100 million years ago. For the full story, click to read the article in Newsletter December 2006.